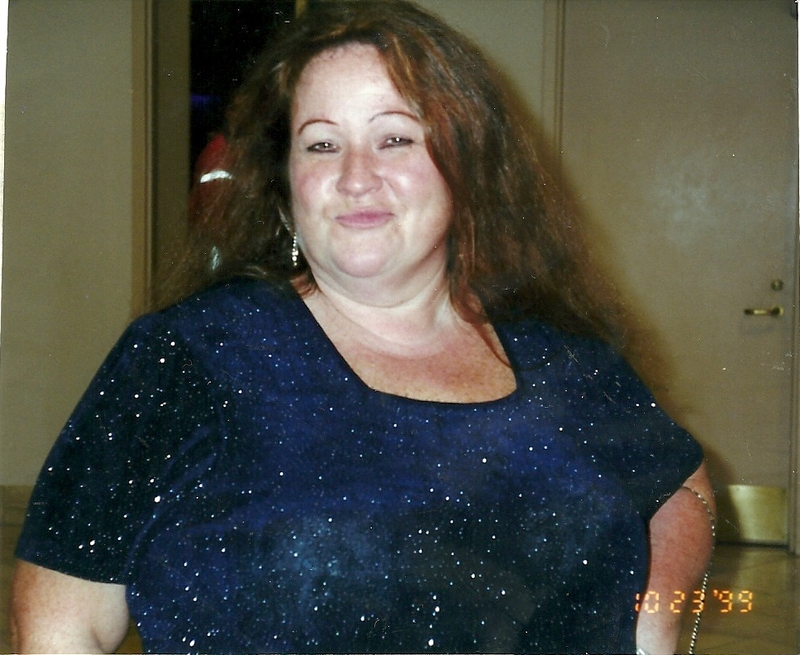 It was late-October 2005 when the dizzy spells, near-fainting, chills, and vomiting had finally gotten the best of her. “Okay, I’ll go.” Momma allowed us to help her down the front steps and into her Ford Explorer. She clutched the bowl we’d given her “just in case” and waited patiently for us to take her to Johnson Memorial Hospital. After hours in the emergency department, the doctor came in to deliver the news. The lights in the room had been turned low to allow Momma a chance to close her eyes for some sleep as night had crept in. “She has a large tumor. We’re going to admit her.” More waiting. Then a slow meander up to her room. “Visiting hours are over,” we were informed almost immediately by the nurse on duty. I kissed her goodnight and promised that we’d be back first thing in the morning. When we returned to her room the next morning, we found her in a johnny. She was sitting up in bed with her back to the door. She smiled when we came in. “I’m not staying here,” she decreed. She agreed that home wasn’t the right place for her. But neither was Johnson Memorial Hospital. “I want to go to Hartford Hospital,” she announced. Her primary care physician was none-too-pleased as she doesn’t work in Hartford Hospital. But Momma insisted. And Momma gets her way. Within a few hours, we were getting her settled into her new room at Hartford Hospital. I remember lounging in her hospital bed that day, adjusting the controls to incline the back as I crossed my feet at my ankles. Momma wasn’t there at the time—they had her off for another test. My sister Bree and Momma’s best friend Frankie were with me. I remember one of them said something about an oncologist and was met by a funny look from me. “What’s that? A blood doctor?” They book just looked at me. “You do realize we’re in the oncology ward, right?” Frankie asked. I let a plump tear roll down my cheek as the reality hit and the worst case scenario flashed through my mind. Quickly, though, I returned to my youthful optimism. She’d get through this. I just knew it. The following months are a blur to me. I remember snipets of events—both happy and heart-wrenching. That Halloween, I brought decorations and a big bowl of candy from home to set up her room for her Trick-or-Treaters—my sister’s boys. They came decked out in their costumes, knocked on her hospital room, and held up their pumpkin containers to accept their surprises from GranMommy. She welcomed them in and let them climb all over her bed while she reclined in the chair and chatted. She was herself then. As the weeks wore on the tests continued to mount up. Biopsies and blood transfusions became the norm. Chemo started. She lost a lot of weight. The skin on her hands and feet began to peel, no matter how much lotion we applied. Her legs lost a lot of strength so getting up to walk around began more difficult. She was afraid to take her hair out of the scrunchie she had it looped up in for fear of it falling out in her hands. She had a visitor with her at all times—Poppa, Bree, Frankie, or I never left her side. And we had no choice. Momma was a very private person and insisted on submitting a written request to the hospital that they do not release any of her information to anyone asking for her. “Don’t lose her,” nurses warned us. “If they take her for a test, you make sure you find out where she’s going and when she’s coming back. Because if you don’t know where she is, no one can tell you.” I spent lots of nights curled up in a cot on the side of her bed, listening to her IV pump (which sometimes pumped fluids only and other times pumped “liquid Big Macs” as she referred to the nutrients they gave her when she wasn’t able to keep food down), trying to ignore the nurses who came in to check her vitals every hour, and trying my best to enjoy the “quality time” with Momma. One day, Momma was feeling especially adventurous. Her mouth was dry and she wanted nothing more than to brush her teeth. Though the sink was only a few steps from her bed, her legs weren’t strong enough to walk her there so we improvised. We swung her legs over the edge of her bed, sat her up, and handed her a spit cup and her toothbrush. After we stepped aside, she caught a glimpse of herself in the mirror and literally did a double take. Her eyes filled up as she took in her reflection for the first time in weeks. Her cheeks and eyes had sunken in, her face was pale, and her hair was a knotted mess in her scrunchie. “I don’t even look like me.” She didn’t ask to brush her teeth again after that. At one point, she got discharged to the care of a visiting nurse. And after a few days at home, she had to be returned to the hospital. She didn’t want help getting from the living room of her raised ranch to the car, which Poppa had pulled across the front lawn and literally up to the front porch. So she sat on the top stair and slowly lowered herself down one stair at a time. “Goodbye, house,” she said on her way. At another time, she was transferred to Haven Health—my 47-year-old mother in a nursing home!—to undergo therapy to help strengthen her legs again. She was there for three days and despite the staff’s urging that we leave at the end of visiting hours, one of us was there for three days, too. They didn’t encourage overnight guests which meant they had no cot to offer us. So Poppa moved the recliner from our living room to her new room. During her short stay there, we handled about 90% of her care ourselves. And it was probably better off that way, especially after what I observed on her first night there. A nurse came in to check her vitals and said she’d be back to do a finger prick for a glucose test. When the nurse returned, she positioned herself between where I sat (by the door) and my mother’s bed so I couldn’t see what she was doing. But I heard my mother say, “What’s that? Don’t prick my finger with that!” I questioned the nurse on her way out the door and was told that she was just doing a glucose test. When she left the room, my mother looked at me with huge eyes and insisted, “She used a syringe!” A few minutes later, the nurse returned and produced a lancet for me. “I realized after I left I should have just shown you what I used.” Mmhmm. My mother was sick. Not senile. It was mid-December and we were back at Hartford Hospital when I finally convinced her to let me brush her hair for her. “I’m afraid,” she admitted. I assured her that even if it did fall out, it would grow back. Poppa sat on the cot strumming Christmas carols on his guitar as I carefully took out her scrunchie and began brushing. When I saw how much hair was coming out with each brush stroke, I moved the trash bin to my feet so I could discretely clean the brush out without her noticing how often it had to be done. But she noticed. She gripped my forearm and gazed up at me with glossy eyes. “It’s okay. Just cut it off.” I did hunt down a pair of scissors from one of the nurses that night, intending to give her the haircut she asked for. But I couldn’t bring myself to do it. I continued to brush. Carefully. Slowly. Until all of the knots were out. And, sure, her hair looked thinner but she still had a lot of it. And she smiled brightly when she looped it back up into a loose ponytail and thanked me. We spent New Year’s Eve in the ICU. Her blood pressure was very low and most times she wasn’t lucid. On January 1, 2006, she opened her eyes and whispered something almost inaudible. I moved closer to hear her. She wanted to sit up on the edge of her bed. She said she wanted to feel her legs swinging. I alerted the nurse and was immediately told that she was not allowed to sit up because of her blood pressure; she was at risk for fainting. I suggested that we stand on either side of her to make sure she stayed in place but the nurse still refused. I remember raising my voice and I remember someone (Bree?) suggest I let it go. I collapsed into the recliner in her room, defeated, wishing I could give Momma what she wanted. And then it happened. She moved one of her legs off the bed, opened one eye to look at me, and smiled as best as her dry mouth would allow. She closed her eyes and swung her one leg back and forth. And in that moment, I realized that she may not look the same. And often she doesn’t act the same anymore. But it was that moment that I knew her sarcastic, fun-loving personality hadn’t been robbed by the cancer that coursed through her blood. And sick as she was, she was still my Momma and she knew I needed that moment of levity. Momma passed away the following afternoon. I’m not prepared to share the details of that day. I may never be. But I was right there with her, holding her hand until after she exhaled her final breath. Today would have been her 55th birthday. And she would be so pissed if she were to see me getting teary and reminiscing about her final months. She’d rather I be at the casino (which is where she opted to spend her birthdays) or remembering the good times. So I think I’ll go open her bottle of perfume to take a whiff then drift off to sleep while listening to some Kris Kristofferson music. I’m a sentimental person so when I first read this week’s writing challenge, I was stumped. There are lots of things in my life that mean the world to me. Things that make me have a minor panic attack to think of them missing. But there has to be a way to narrow it down to the one thing that matters most. Immediately, I started dreaming up worst-case-scenarios….a ravaging house fire, a break-in, a zombie apocalypse. What would I save? The first thought that came to mind, of course, was my family. Certainly if the zombies were knocking on the front door I’d want to sneak Chris and our two furball kids out the back door, right? But people—and yes, my dogs are close enough to count as people—aren’t possessions. And I’d like to think they’d be helping me pack, not requiring saving. So then important documents came to mind—my birth certificate, our mortgage paperwork, my college diploma. But if only ashes remained of our home, would those things really matter in the grand scheme of things? Couldn’t they all be replaced? Which led me to the things with the most sentimental value—the hope chest my mom bought me as an early wedding gift a few months before she passed, the urn holding her ashes. But no burglar could possibly lug that hefty piece of wood furniture out without getting caught and who in their right mind would target my mom’s urn before the electronics, anyway? “What is my most prized possession?” I asked Chris on Monday night, wanting to hear what he thought. He held up his left hand, smirked, and grazed his finger over his own wedding band. He was surely remembering our recent fight when a whole day passed without us knowing where his ring was. For the second time this year, mind you. I had cried. I had lectured him. We both tore the house apart. And lo and behold it was found on the floor of his closet; it had literally slipped off his finger while selecting his shirt the night before. We learned that day just how important our wedding bands are to both of us. 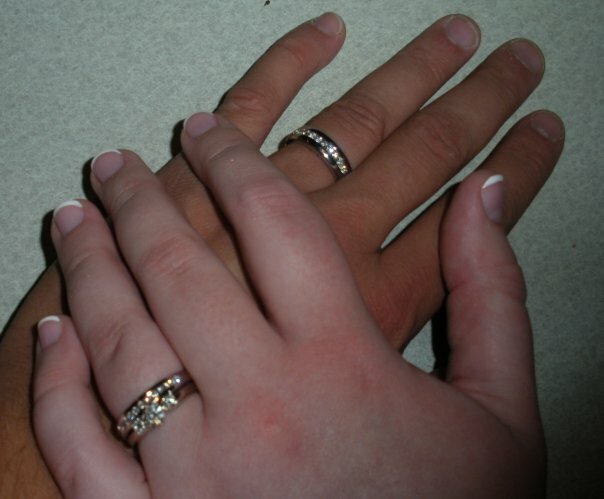 Because even if we paid a visit to our jeweler and bought an identical ring, it would never be that ring. The one I gave him on our wedding day. So, yeah, my wedding ring is important to me. But I’m a logical person. And I know that my ring is never not on my finger. So if I’m escaping tragedy, it’s coming with me by default. And then it hit me. The family photo albums. When the albums are opened, the photos inside tell their own stories. Immediately, I am transported to a time and a place where I didn’t even exist yet. A simpler time. When my dad was a long-haired bassist for his band Whiskey River and my mom was a cigarette-puffing flower child. When the kitchen walls were as bright as the living room upholstery was floral. When now-divorced couples were in love and late family members were still with us. Browsing through the family albums allows me to experience memories I had forgotten about and events that happened before I was born. Here are some of my favorites that capture the era and/or my childhood the most vividly for me. 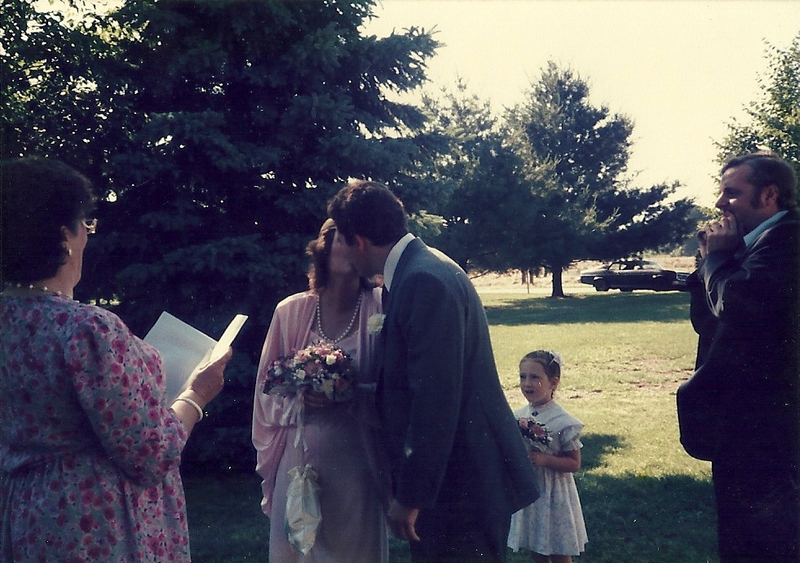 This photo was taken on June 2, 1979 at my uncle David’s wedding reception. 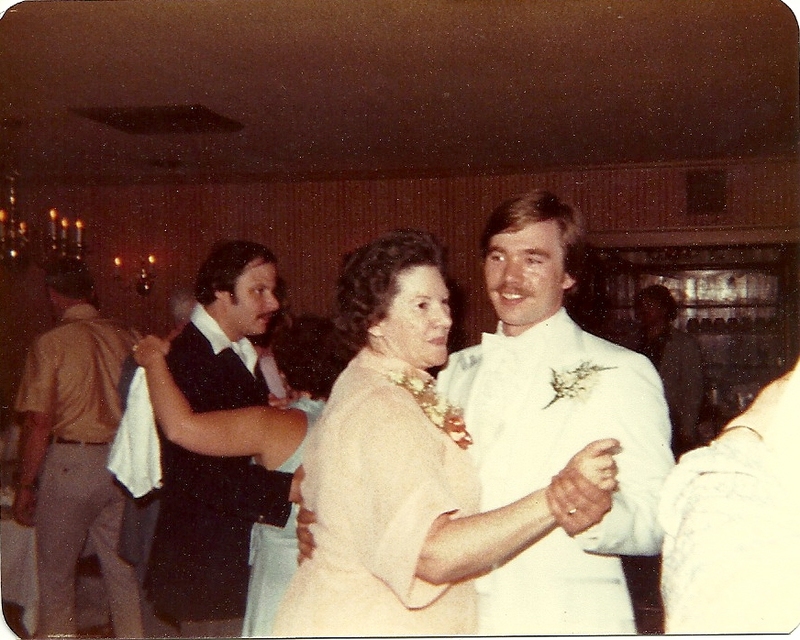 Here, he dances with his mother, my grandmother Edith Dunham. This photo (along with the others from that day) make me wish that my generation had weddings like this….semi-formal functions full of family, including kids. Instead, weddings today have turned into $50,000+ productions that often lose sight of what should be the focus of the day—love and family. 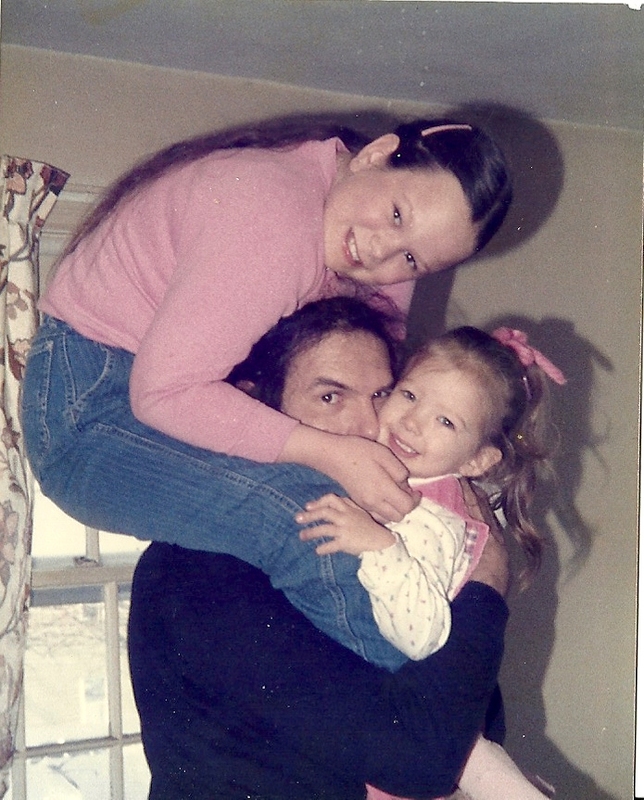 My dad and us girls were often the subject of family photos because my mother preferred to be behind the lens. 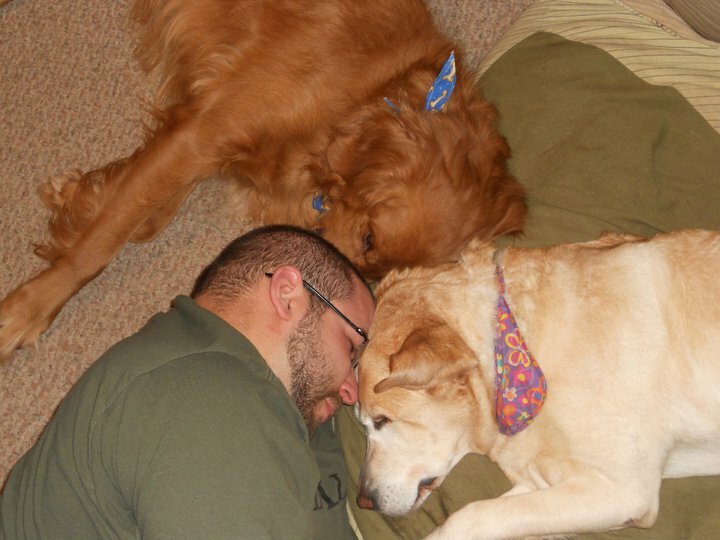 I love this photo because it shows a typical night at our house; When dad got home from work, his job as “dad” began. That sometimes meant letting us climb all over him and other times it meant he had to change our doll’s diapers. But I also love this photo for the gaudy floral curtains, the console TV, the brown-and-mustard decor, and the record player resting on top of the stereo speakers. If this photo doesn’t scream ’80s then I don’t know what does. 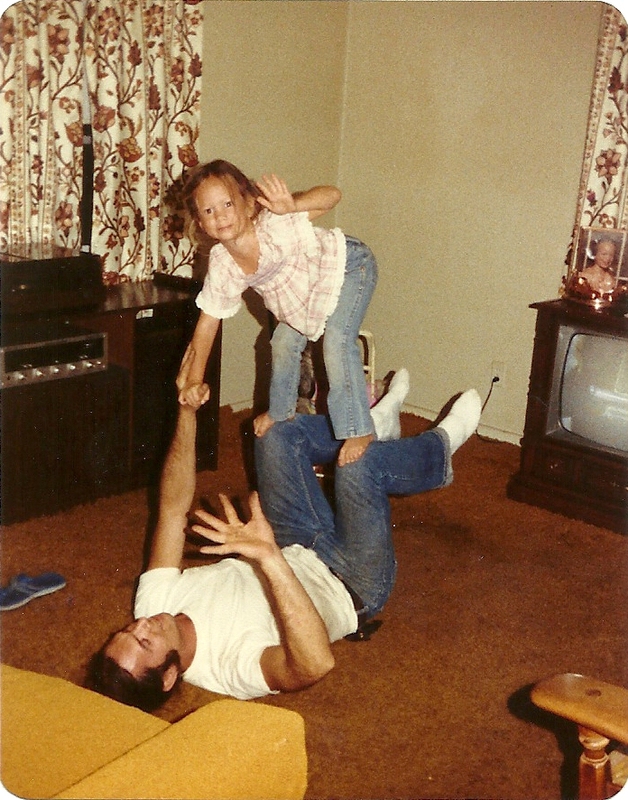 This photo was from two years before I was born but it features two people I call my “pseudo-family.” This photo helps remind me just how long our families have been as close as we are to this day. 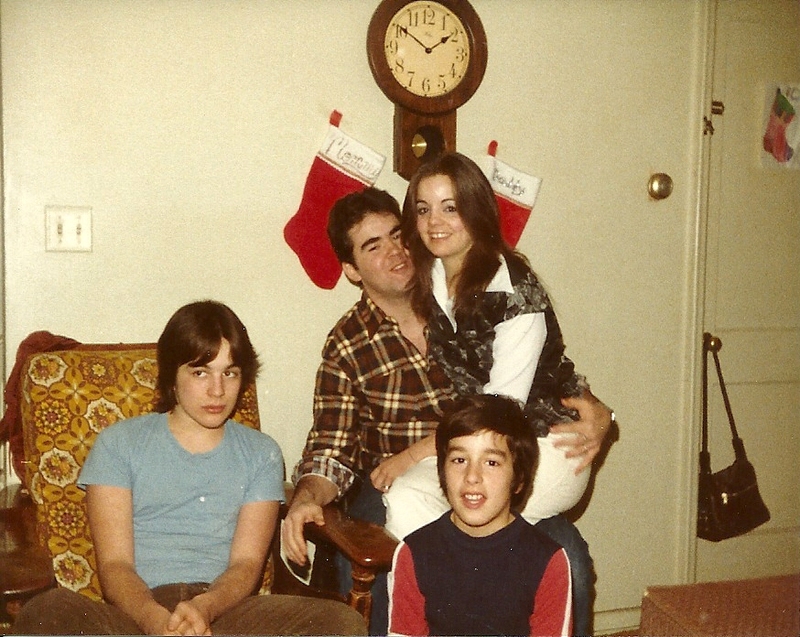 Uncle Kevin and Aunt Debbie are divorced now but here they were when they were just starting their marriage. I love how relaxed and happy they look in this shot. The other thing that speaks to me in this photo is the clock on the wall in the background. Its face is yellowing here but I’m told it was “white as the driven snow” when my dad bought it. Today, it hangs in my father’s finished basement. And its face is a dark brown shade. He told me that the color change was due to years of him smoking in our old apartment. And he said he hung it in the basement when we moved into our house (around 1990) as a reminder of why he vowed to not smoke in our new place. 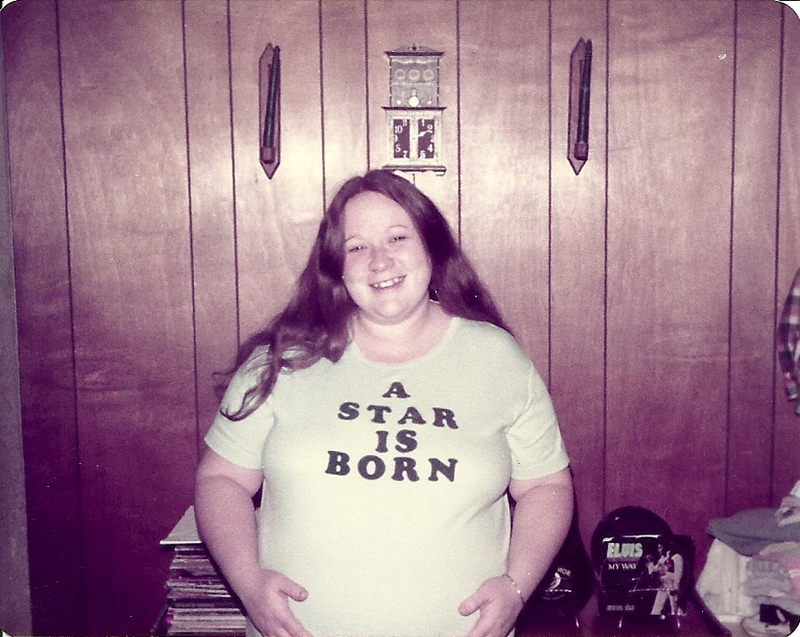 My mother hardly ever agreed to be the subject of a photograph. But here she is. Just two months from giving birth to me. Smiling and happy. The dark wood paneling and pop culture reference on her t-shirt are just added ’80s bonuses. 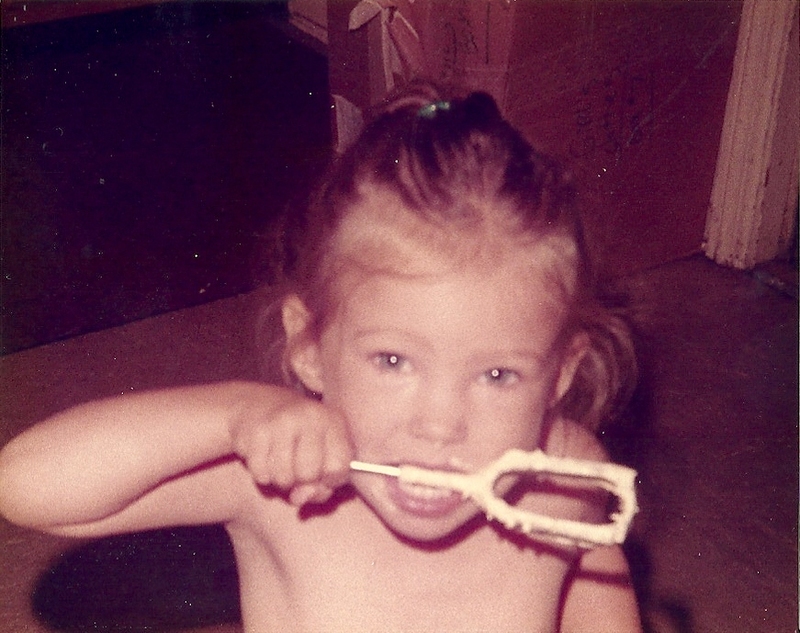 Remember when licking the beaters after mom made cake was a privilege—not a cause for concern that you might contract salmonella poisoning? It was also around the time that kids played games that didn’t require chargers or a screen. And you might pause from washing the car on a hot summer day to take a swig from the garden hose. I was barely older than two here but miss those simple times. 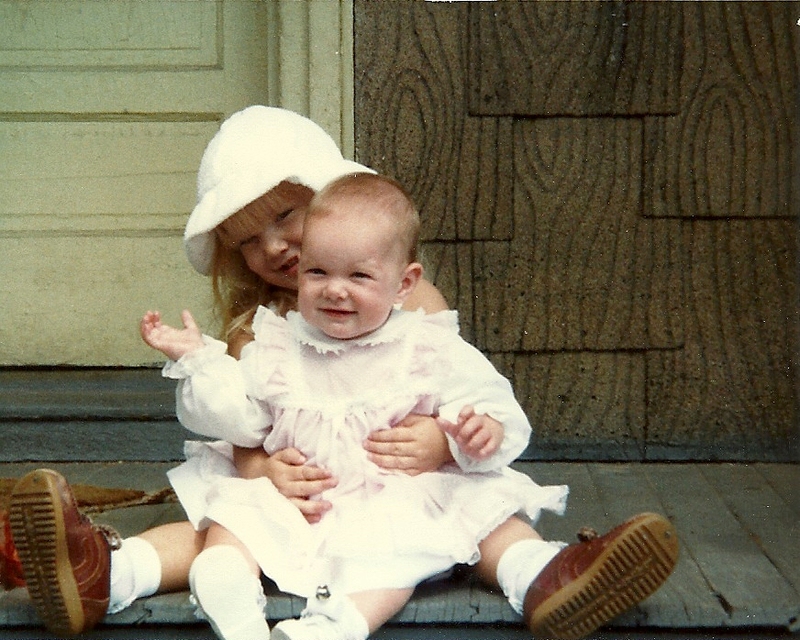 This is one of my favorite photos of my sister and me. Bree was 10 years old. I was almost 3. Dad had his hands full. There was never a question as to what we’d be doing on Easter Sunday. At noon, we’d be at Grammy Beltrandi’s house for her annual Easter Egg Hunt. She’d enlist her boys (my uncles), all swigging off their Budweiser cans, to hide a slew of plastic eggs for all us kids. Some were filled with coins. Others were filled with candy. And the special ones—the ones that earned you a prize at the end—were wrapped in tin foil. 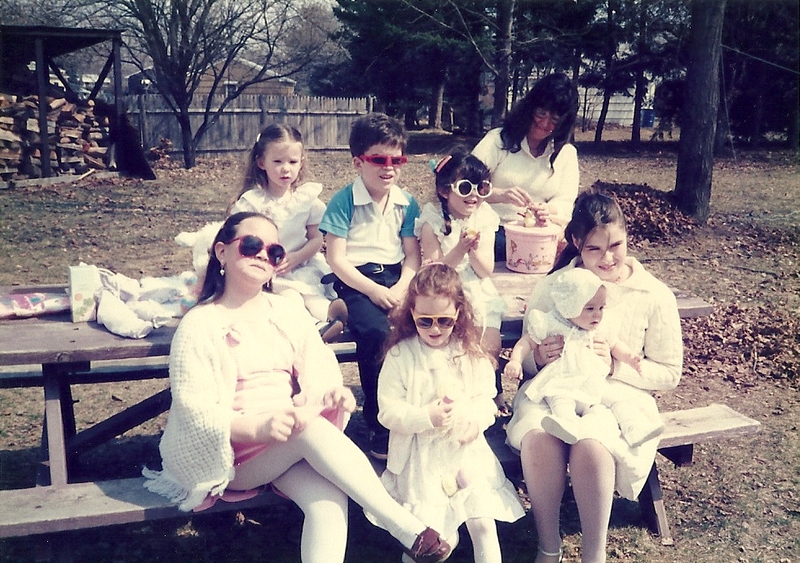 Clearly the prizes in 1986 were sunglasses. I didn’t know that they didn’t get married until their first-born Nicole (holding the bouquet behind them) was about 5 or 6 years old. I also had no idea that my great aunt Sandy was the one who married them. I love this photo because, again, it depicts a simple wedding focusing on love and family rather than on glitz and glamour. And check out that car in the background….I may be mistaken, but is that a Chevy Nova? 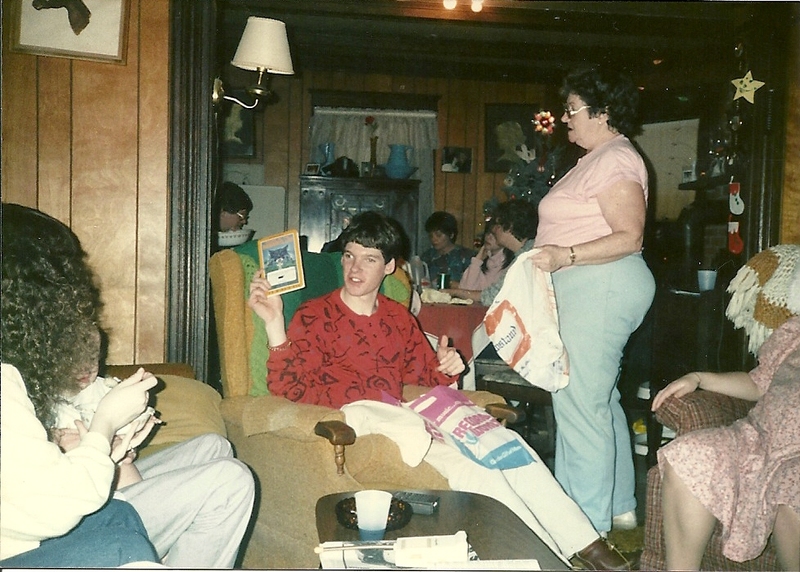 These two photos were both taken on Christmas day in 1986. 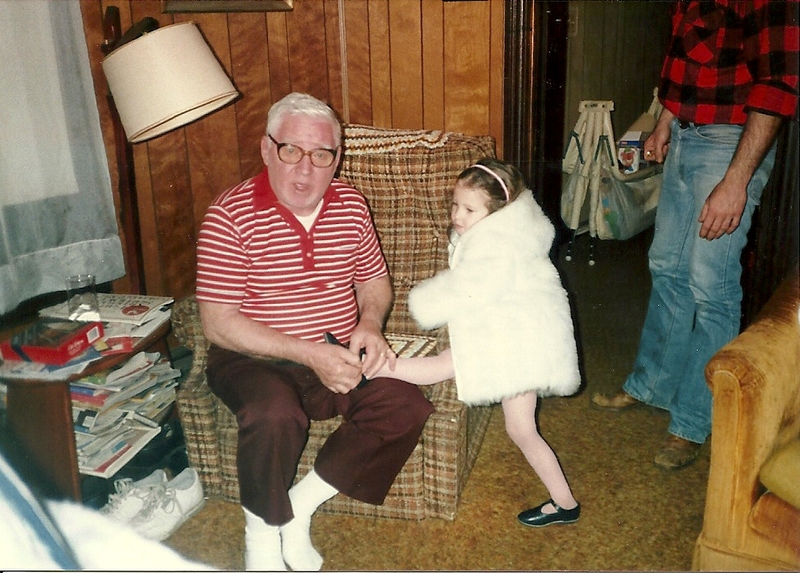 I may have been too young to remember this particular Christmas, but I remember that Grammy and Pop-Pop always had a huge pot of spaghetti warming on the stove along with all sorts of other homemade dishes and desserts. Their house was a gathering place for family. No one needed to wait for an invitation. No one needed to RSVP. They knew you were coming. And it didn’t matter what time you showed up. Us kids ran throughout the house all day, including up and down the creaky spiral staircase. The adults sat around chatting. No one had anywhere to rush off to. All we had to do was sit and enjoy our time together. Where did these days go? It seems that every time I open one of our family albums, I discover a new memory I never knew I had. Looking through the photos keeps me grounded and reminds me of what’s important in life. I’d be devastated to lose that ability. And, yes. Someday, before I croak, I’ll finish putting the pictures in albums. The pool was taken down our second springtime in the house. How two years managed to slip past us with that eyesore—empty but for pieces of old, cracked liner and whatever weeds had managed to sprout up through the sand—taunting us from the back yard, I’ll never know. The lifespan of our pool was recounted for us once by our neighbor Hank during one of our first encounters with him. He had gotten home from work one day several years back, he’d said, to find that the homeowner at the time had installed it while he was away. 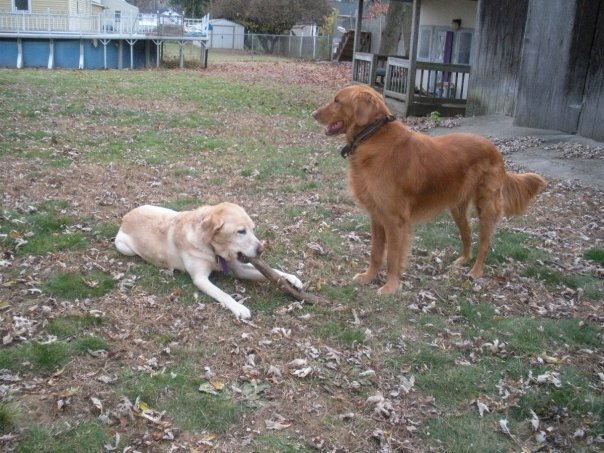 It was positioned obscenely close to the property line but Hank had turned a blind eye. Memories of sleepless summer nights were undoubtedly called to his mind as he eyed the pool, roughly six feet from his bedroom window, and took a moment to reminisce about the rowdy kids who used to live next door. Do you see Hank’s bedroom window in the upper left corner? “So it didn’t always look like this?” I motioned toward the skeleton that remained. Much like how it went up, the pool came down the same way—all in one day, while I was at work. My brother-in-law was just hauling away the final pieces as my car pulled into the driveway. 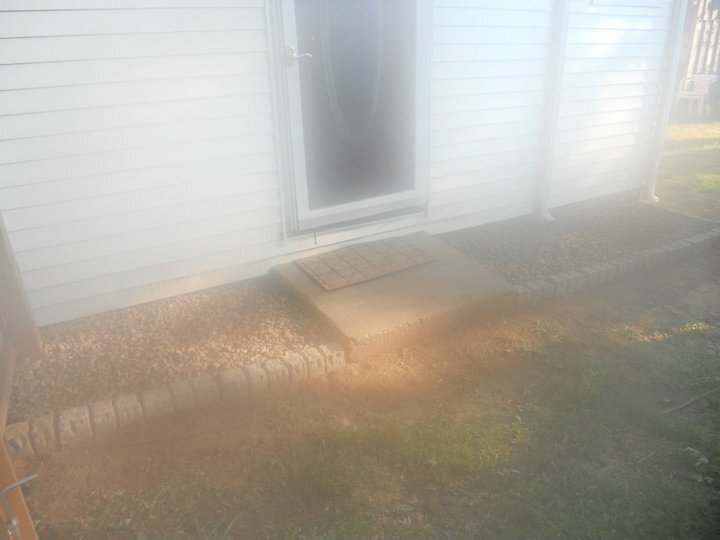 The yard seemed so much larger with that blemish gone and I felt like Chris and I had taken a big step towards reclaiming our yard. That excitement was short-lived, though. Soon, a stark realization slapped me across the face. 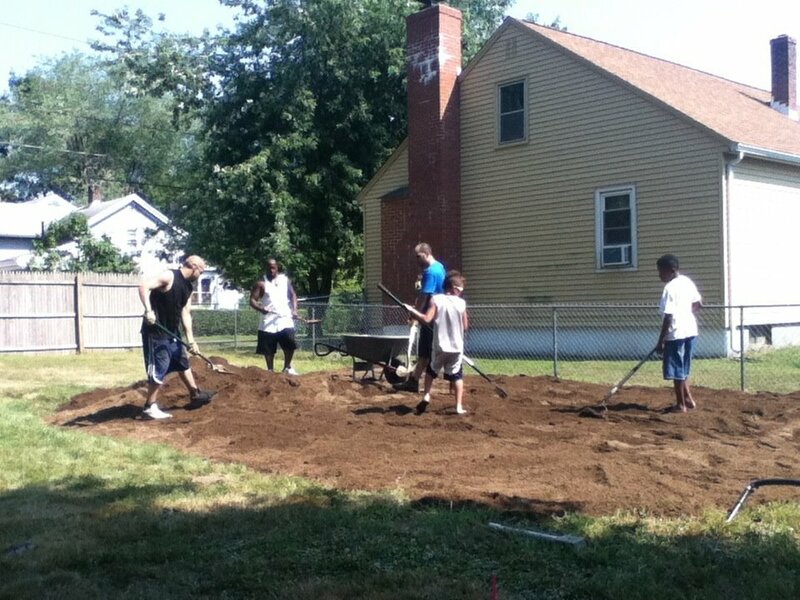 Removing the pool left a new blight: the sand pit that had once cradled it. Garbage bags were filled with debris. And for the first year, the yard waste barrel gobbled up a steady diet of weeds, plucked from our former pool every few weeks. Something would be done someday…. Repurposing the rocks from around the pool felt great! A little over a year later, we’d had enough. The wheelbarrow was pulled from the shed and in the heat of the July sun the rocks that encircled where the pool used to be were not-so-lovingly shoveled out and moved to a newly created rock bed by the back door. Bushes that used to flank the pool were removed. And in our excitement over seeing those changes, we pat ourselves on the back and let the remaining mess slide. Again. This spring marked the second anniversary of our poolectomy—if it’s not a word, it should be! It was in June that Chris came to me and said, “You know what I want for my birthday?” (True, his birthday wasn’t until late-July but if you knew my husband you’d know that his birthday isn’t a day…it’s a month-long extravaganza.) My blank expression clearly gave away that I had no guesses as to what he was thinking. “Dirt,” he replied. The dump truck backed into the yard that mid-July morning through the gap left after Chris had removed two fence panels and the post where they met. 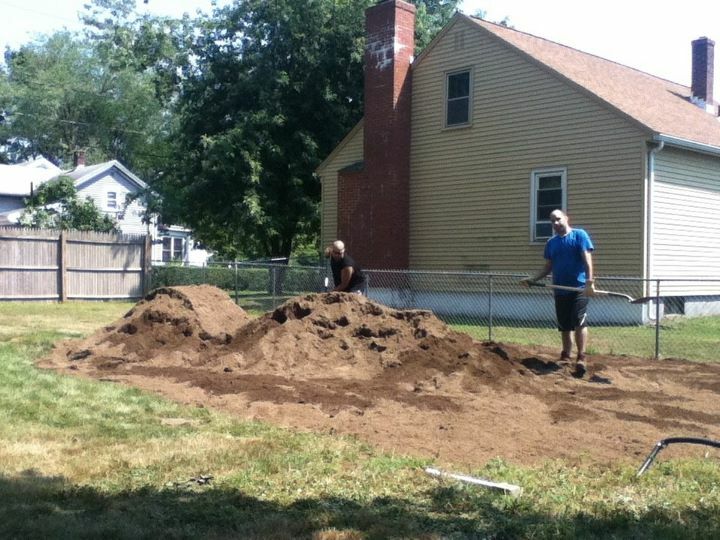 And 20 yards of fresh topsoil was dumped onto what would be our lawn. “You’re gonna want to seed right away,” the delivery driver warned, “or else you’ll be over-run with weeds.” Slowly (and thankfully with lots of help from our family), the mound of dirt was spread out across the sandy crater and prepared for the seed and fertilizer the local Agway salesman helped me heft into the trunk of my Elantra. The seeds and fertilizer were spread. The plot was raked for what felt like the hundredth time that day. And as we covered the newly seeded dirt patch with fresh straw, our other neighbor Dan popped his head over the fence to chat. We confessed that now that it was done, we weren’t sure why we had waited so long to finish this job. Dan shrugged and said, “I remember my first house. I was young and didn’t know anything about owning a house. But what I learned was that it’s a process. You can do things little by little because you’ve got years to make it yours.” His words meant more to me than he probably knew. We anxiously checked on our would-be lawn frequently. And after only about a week, our first sprouts of grass—tiny, tenuous little strands of green—began pushing their way out of our earth. “We have grass!” we told our friends, like proud parents announcing the birth of their first born. A couple of weeks later, the straw was raked up. And on our dirt’s one month birthday Chris celebrated by mowing the lawn. The whole lawn. 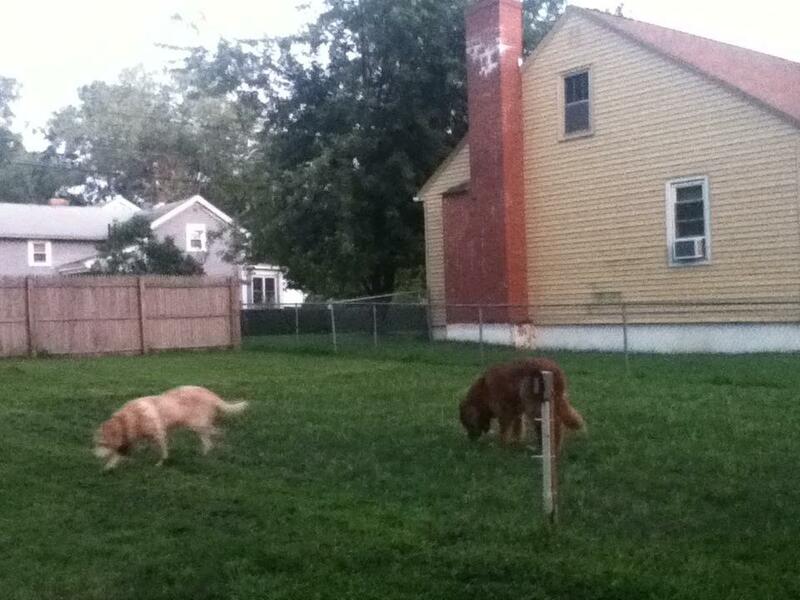 Our kids approve of the new lawn, too.